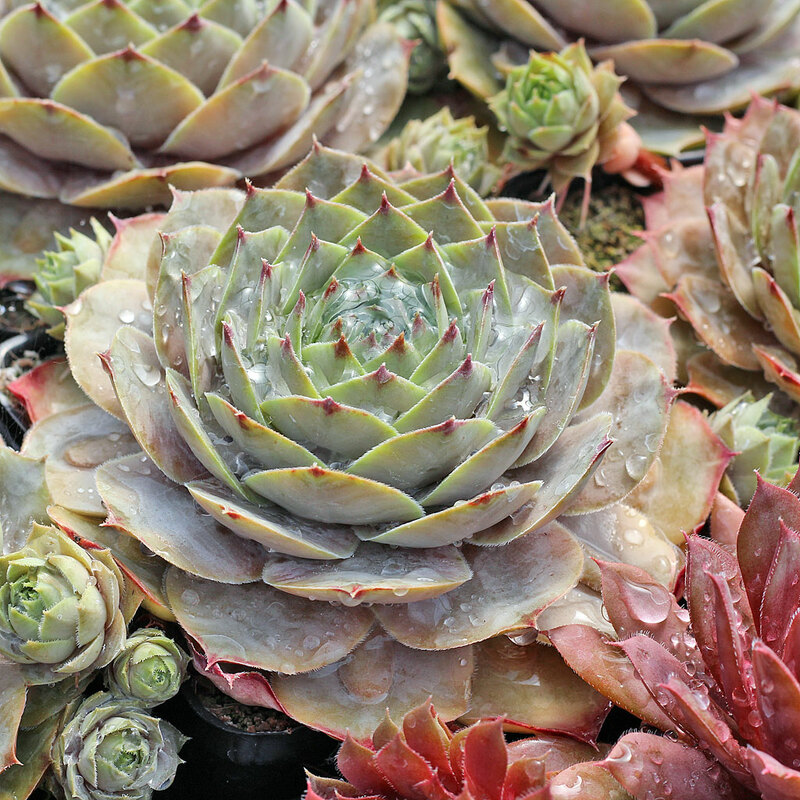 Sempervivum (Hens and Chicks) and Sedum make excellent choices for low-maintenance, outdoor containers and gardens because they're frost hardy, drought-tolerant, and resilient growers. However, there are a few key points to understand about their water needs if you want to create a lush succulent planting. Read on to find out how to water properly and spot the signs of under- and over-watering. How much do I need to water? It depends, but the name of the game is trying to match their native habitat. Hardy succulents are alpine dwellers and will grow best if you can mimic the environmental conditions of the mountains from which they came. Just as they receive regular rainfall when growing in the wild, hardy succulents will need about 0.5" to 1.0" of water (including precipitation) once a week to look their best in the hottest, driest periods of their summer growing season. It's best to water in the early morning or evening to limit water loss to evaporation and prevent beads of water from magnifying the afternoon sun and burning the leaves. This also helps hardy succulents tolerate high heat and sun exposure (full guide on Sempervivum and Sun). Does it matter what they're planted in? Yes, it matters a lot. Sempervivum and Sedum growing atop mountains live with high winds and rocky soil that dries out rapidly. And this is just how they like it! Cycles of drought give succulents a chance to develop large, healthy root systems as they grow deeply in search of water. A raised bed of gritty, well-draining soil is ideal for maintaining air pockets around your succulents' roots. For container plants, a drainage hole and materials like terracotta and hyper-tufa are will help your soil dry more quickly. Gardeners with the best intentions who keep their soil continuously moist can end up with rotting leaves and insufficient root development. Try a top dressing or mulch 3/16" grit gravel to keep leaves drier. Succulents getting too much water in low-lying beds or heavy soil will show signs of distress like mushy, translucent leaves. Once the roots have rotted it is difficult to revive succulents, so avoid over-watering at all costs. Is it possible to water too little? Even after months of drought mature Sempervivum and Sedum can be revived. If you see signs of over-drying like crispy, wrinkled, or flexible leaves, gradually water more deeply and frequently, giving your succulents a couple of weeks to respond. You can also water up to twice a week to help young plants establish roots and encourage faster growth of both creeping ground cover and tall border species of Sedum. Do I need to water in winter? Not as much. In most regions, mature hardy succulents planted in the ground can overwinter without receiving extra water from you. Winter water needs will vary by climate, age of succulents, soil, and where they are planted. Young hardy succulents with unestablished roots or plants in containers, for example, may need a bit of moisture to make it through winter. 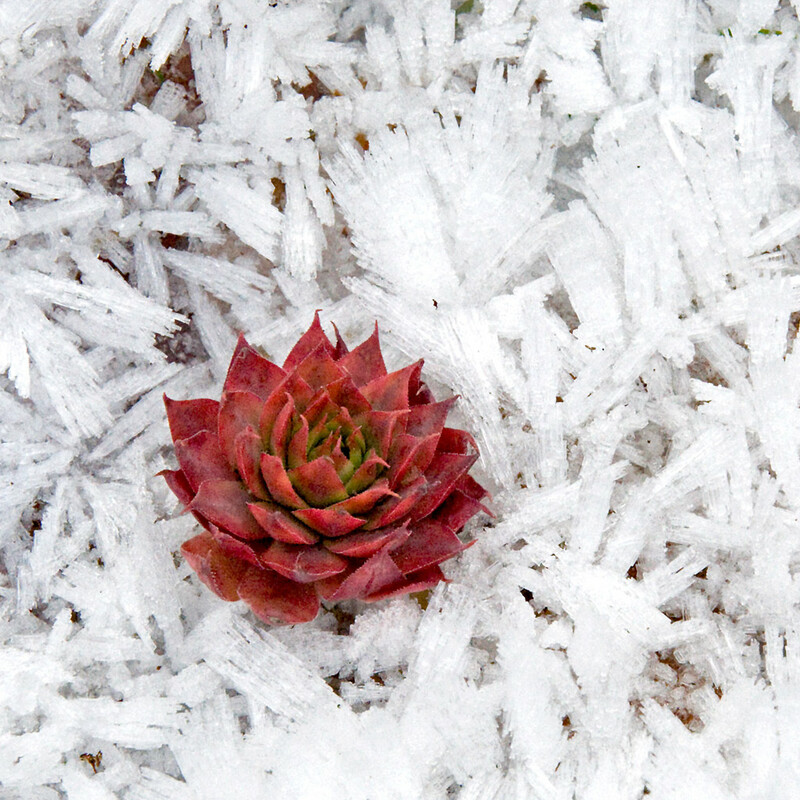 After the summer growing season, wild Sempervivum and Sedum happily spend the winter under a blanket of snow. The dormant plants no longer need as much moisture to grow and the snow protects them from rotting in standing water. For gardeners in regions with cold, wet winters but minimal snow, clear rain covers over plants in the ground are a good alternative way to prevent rot. Be sure to keep the cover at least a foot above the plants to ensure there is enough airflow to keep them dry. This is especially important for the webbed, tufted, and velvety varieties that tend to trap water on their leaves. For hardy Sempervivum and Sedum in containers, move them to a covered area to limit exposure. For more information, check out our full guide on Succulents in Winter. There isn't one simple answer to the question of how often to water hardy Sempervivum and Sedum. Have no fear though, because with the knowledge of how wild succulents grow and an idea of what symptoms of improper watering looks like, you're now equipped to respond to any watering issues! For more information on hardy succulents and other plants with low-water needs, check out Waterwise Plants for Sustainable Gardens by Laura Springer Ogden and Scott Ogden.